IASCOE MEMBERS, DID YOU MISSED A FURLOUGH FORM? REQUEST ACCESS TO THE IASCOE FACEBOOK PAGE. I was contacted by a few employees tonight that wanted our membership to know about what they had learned tonight about how their current TSP loans will be handled during this furlough. They felt after reading Stacy’s post that they wanted to share with others, and I am glad they did. I was unaware of this. I might have defaulted on my TSP loan that I currently have. Since we are not getting paid during the furlough, if you have a current TSP loan, you are still responsible for making these payments timely. There is no waiver on TSP loan repayments. If you miss 2.5 payments (remember these loans are paid bi-weekly) on your current outstanding TSP Loan, the loan will be closed and you will then have to report your remaining loan balance as income for 2019. This could play havoc on taxes and your tax bracket this time next year (2020). This employee informed me that you can visit the www.tsp.gov website they have tons on information in regard to TSP accounts and how the furlough will affect them. She stated that the TSP person stated you need to make “manual” payments using the TSP-26 form. The mailing address is included on that form. If we do eventually get back pay, the payments you made “manually” during the furlough will not be refunded. They will remain applied to your principal on your loan. The other option they wanted you to know about was the hardship withdrawal from TSP. This can only be done 1 time every 6 months. There are some negative impacts to this though. If you take a hardship withdrawal, TSP contributions are stopped for 6 months and the employee would have to go back and set their contributions when the 6 month window. Failure to do this will affect your retirement. You would also have to pay 10% (we believe) taxes on the withdrawal. You can do this upfront and have it taken out from your withdrawal amount OR settle them on next years tax return. I feel that this will show as “income” as well. This might be another option for those who may not be able to wait for unemployment or cannot / do not want to apply for bridge loans. These employees were also told you cannot apply for a new TSP loan since we are currently in furlough status. I think this was great information to pass along tonight. Thank you to the employees who took the time to research this to share with everyone. JOIN OUR IASCOE FACEBOOK PAGE FOR MORE UPDATES. January 15, 2019: Deadline to Submit Scholarship Applications. January 15, 2019: Deadline to Submit Distinguished Service Awards. The three categories are: Service to Community, Service to FSA, Service to NASCOE. Shop On-line at the Emblems Store. 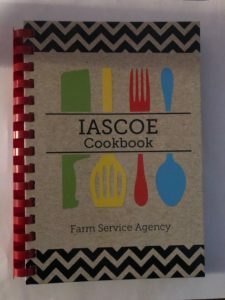 IASCOE Cookbook Fundraiser: IASCOE is selling these fine cookbooks for only $10.